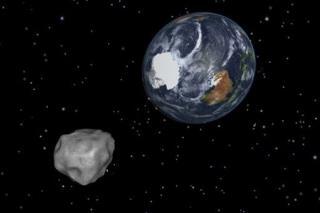 (Newser) – NASA is hard at work to protect the Earth from asteroid threats, NPR reports. The agency's new "Scout" detection system scans the skies above our planet for small, nearby objects that might enter Earth's orbit. In fact, a small one between 5 and 25 meters across will come relatively close to Earth Sunday night, though there's no danger of a strike. Once an asteroid is detected, Scout coordinates data from multiple telescopes across the world in order to ascertain if the object will enter Earth's atmosphere, and if it poses any sort of a threat. While more than 15,000 Near-Earth Objects have been recorded over the course of history, astronomers say many, many more pass by undetected.